FRESH There are 3 products. This is a relatively new category in fragrance. Fresh scents for men are characterized as clean, modern and bright. Predominant are notes such as lemon, bergamot, orange, grapefruit and mandarin. They usually mix with green aquatic notes. Fragrances from this group evoke the sea breeze and the sunshine. That is why they are considered suitable for the summer season. 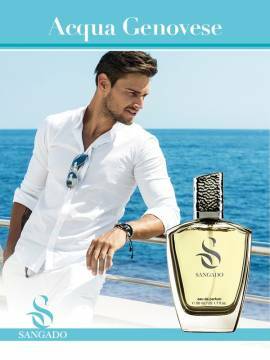 Here are our recommended SANGADO fresh fragrances for men. Our fresh perfumes for men use only premium-quality aromatic oils and are “Eau de parfum” class due to the high concentration of essential oils. Top-notch quality at a cheap, discounted price. This signature fragrance was designed to make a bold statement and is the epitome of sexiness. The protagonist is non-conformist, free and hedonistic. An inherently masculine fragrance, simply irresistible to women. This fragrance symbolizes seduction. This is the scent of the ultimate womanizer - the natural alpha male, radiating confidence and presence. This fragrance arouses her senses and makes a strong and lasting impression.